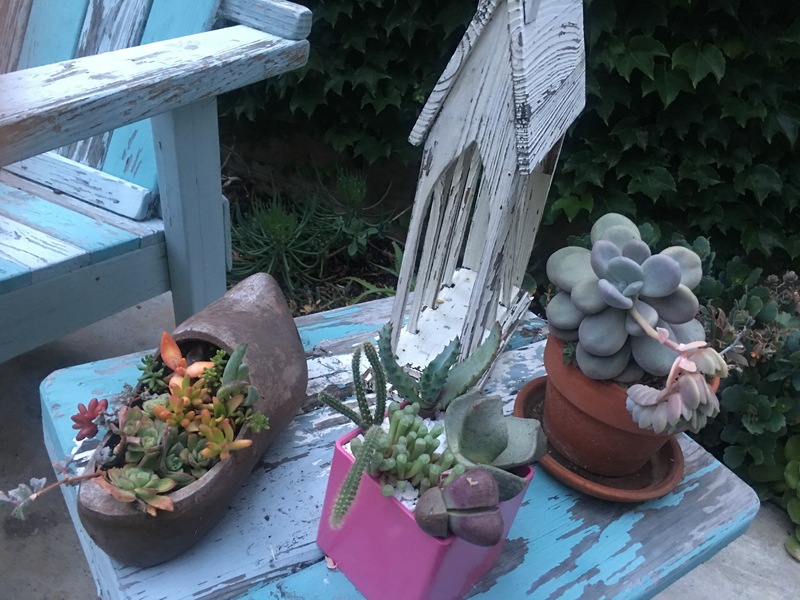 A friend wanted me to share some photos with her sister who is remodeling a yard in Pasadena…hopefully with succulents. Here’s a few I had on hand! Everything you see here including containers is used, recycled, yard sale, or something on hand. Even the Thanksgiving table decor was succulents and things we had on hand, including some big Fall maple leaves. 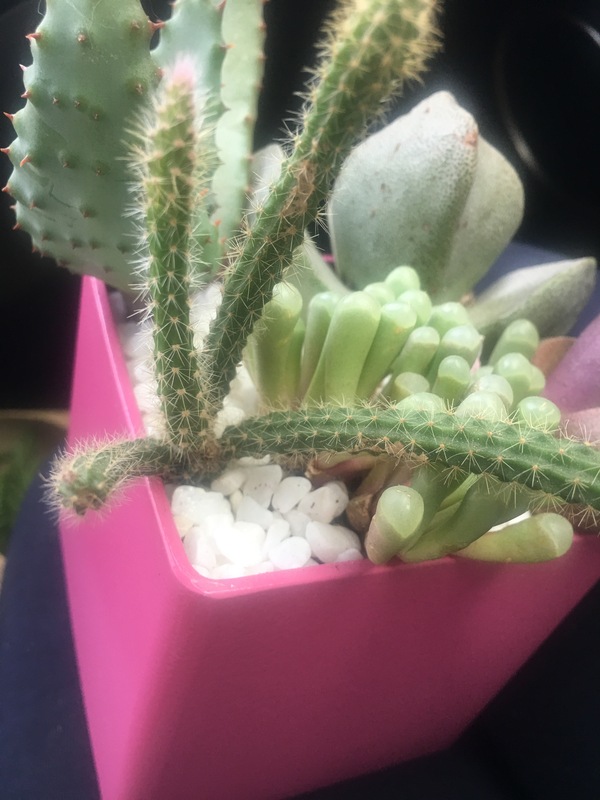 I rarely buy succulents, as they are the perfect clip and plug! 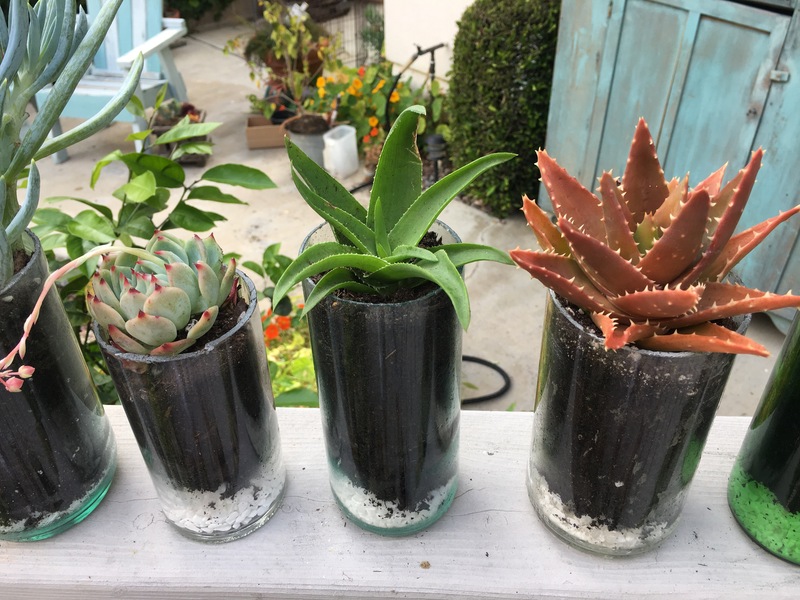 If you’re looking for great succulent inspiration, make sure to follow @Debra Lee Baldwin. She’s the queen. Notice large Staghorn Fern – My Grampa’s! 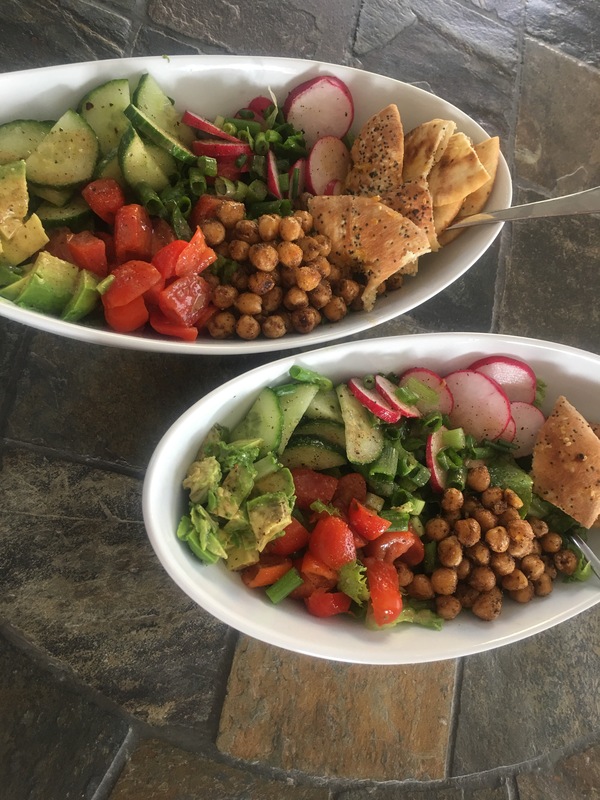 My daughters and I have been following this great vegetarian/vegan blog called A Couple Cooks – http://www.acouplecooks.com Tonight made another great filling low calorie and super healthy dish. Lots of nice color, and I had EVERYTHING in my fridge (rare!). 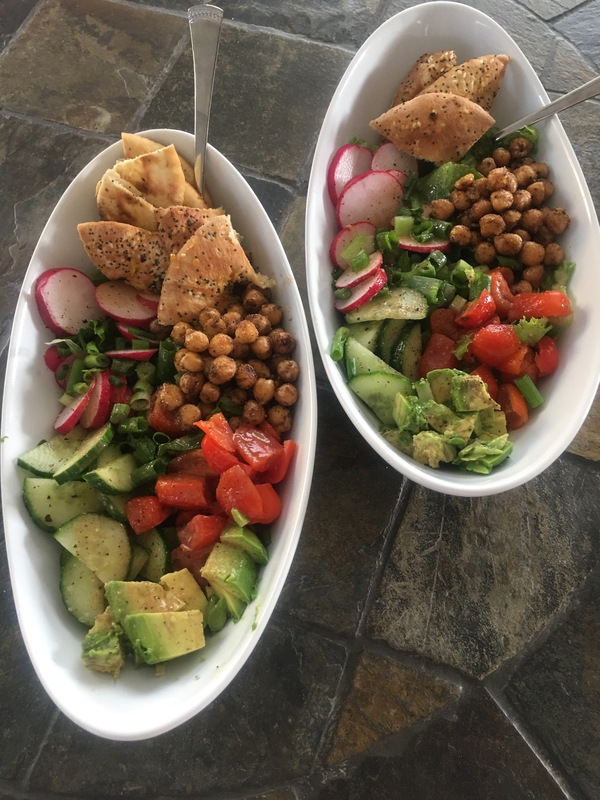 Also had leftovers, even though I made just half the recipe. 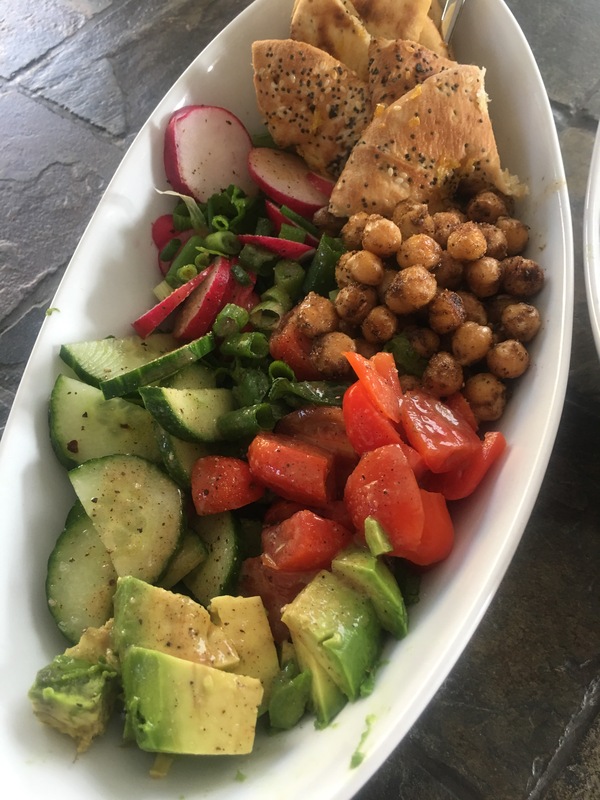 The dressing is super good and the cinnamon and allspice gives a nice little spicy kick to the ordinary dressing. Give it a try. PS. The pita bread at Sprouts was 190 calories, so I opted for the everything thin bagels instead (100 calories) and added half an avocado! A great trade. 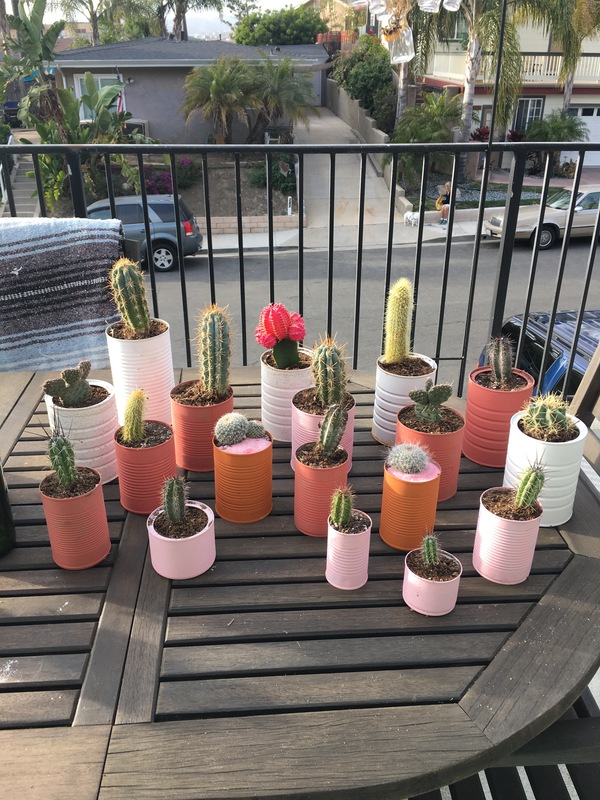 We are in the prep stage for another daughter’s wedding, and using our own succulents and cactus as the main feature for table decor. 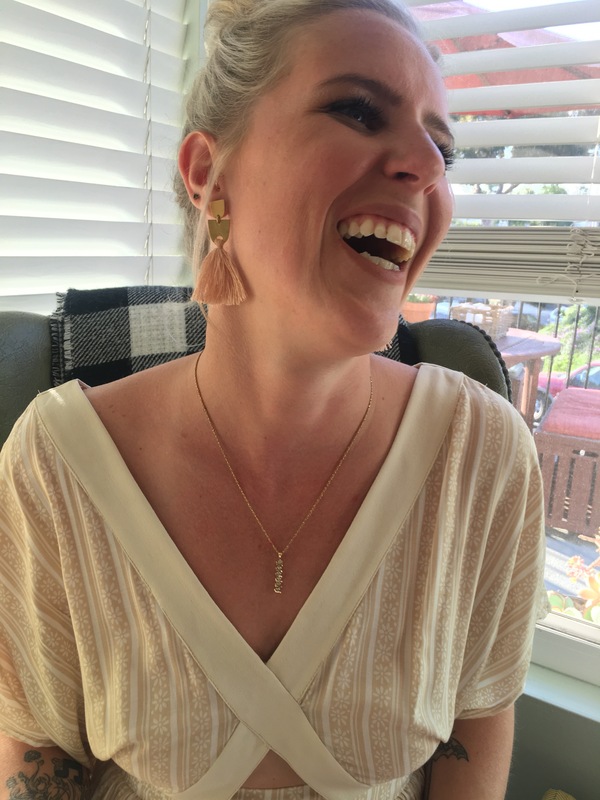 Chelsea (bride – 27 – my daughter) has such a natural way of putting a unique touch on decorating. She’s my go to person when I’m having Thanksgiving, a dinner party, or any event at my house. She can pull things together in ways that are amazing to me. She looks in my cabinets, drawers, book shelves, and even plants in the yard, finding a variety of items to use that are right before my eyes. Usually my tables look bomb and I take all the credit! Chelsea and Brendon’s wedding is going to be in Palm Springs, June 2017, at the historic Cree Estate – a large home with lots of great desert vibe. 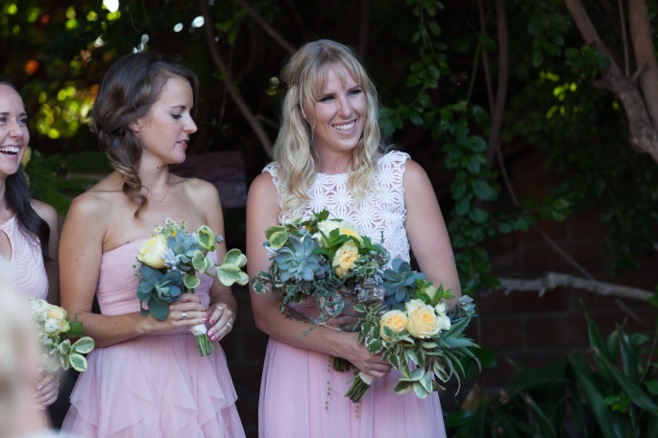 Chelsea and I are both big succulent enthusiasts, so we knew right from the beginning that we would be a part of the floral for her wedding. I think I can take some credit for her love of succulents. 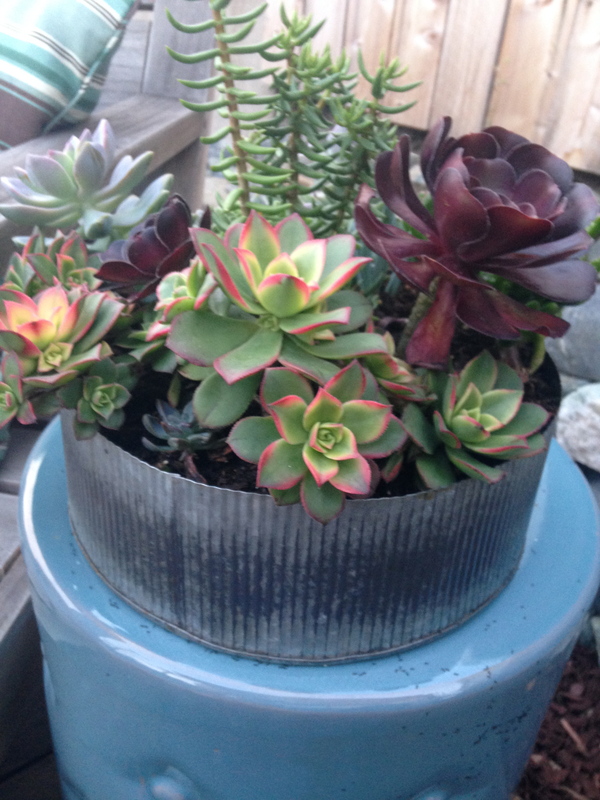 When I moved back to southern California in 2010, succulents were just catching on, especially with the extreme drought. 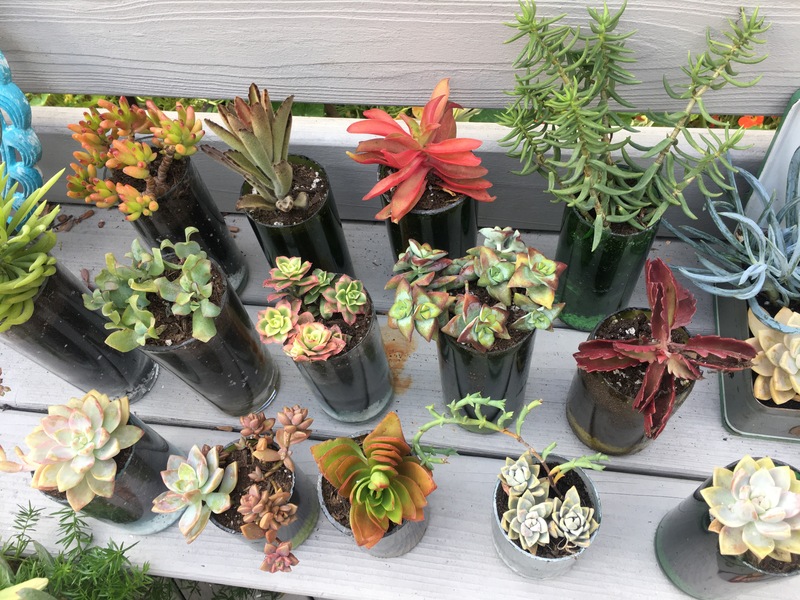 What we didn’t expect was the variety, color, flowers, and little watering! 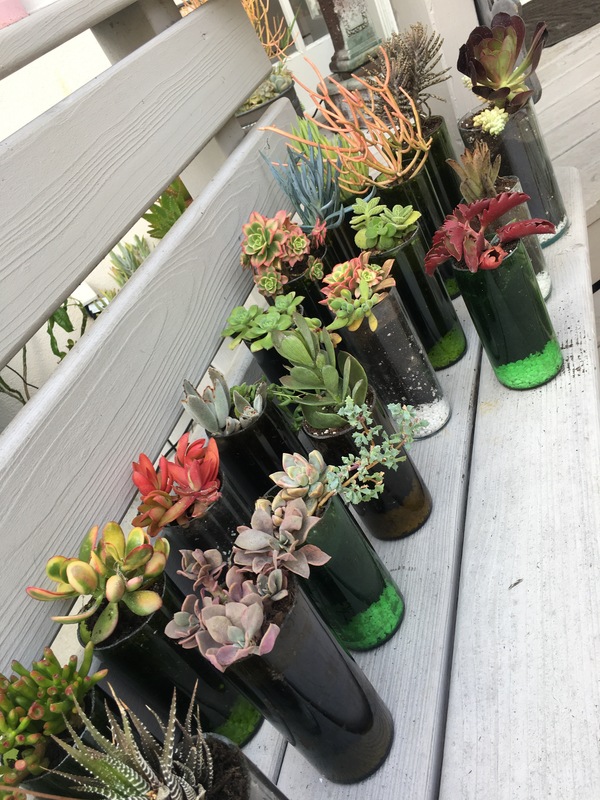 My little yard became a paradise, and I used cuttings from my own plants, neighbors, and some here and there to make pots and plantings that were crazy gorgeous! 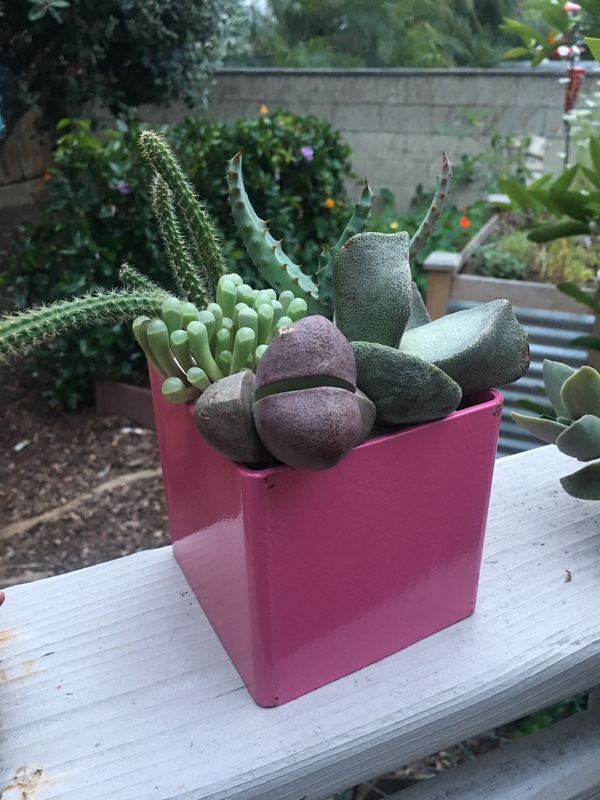 Together Chelsea and I have had so much fun creating some really unique, and sometimes wacky planters. We hit up yard sales for pots and containers, take them home and drill a hole no matter what it is. 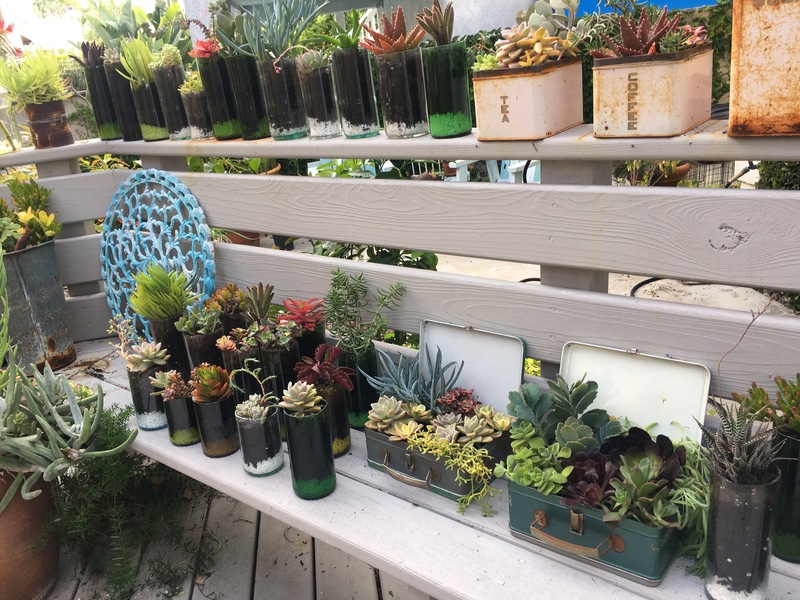 Chelsea wanted to help design her wedding centerpieces and we worked with a local florist who loves succulents as well, but was willing to work with us on cost since we were going to be providing most of the plantings and containers. The florist is focusing on bridal bouquets, boutineers, and a few fresh flowers. The cost was about half of what would be standard! 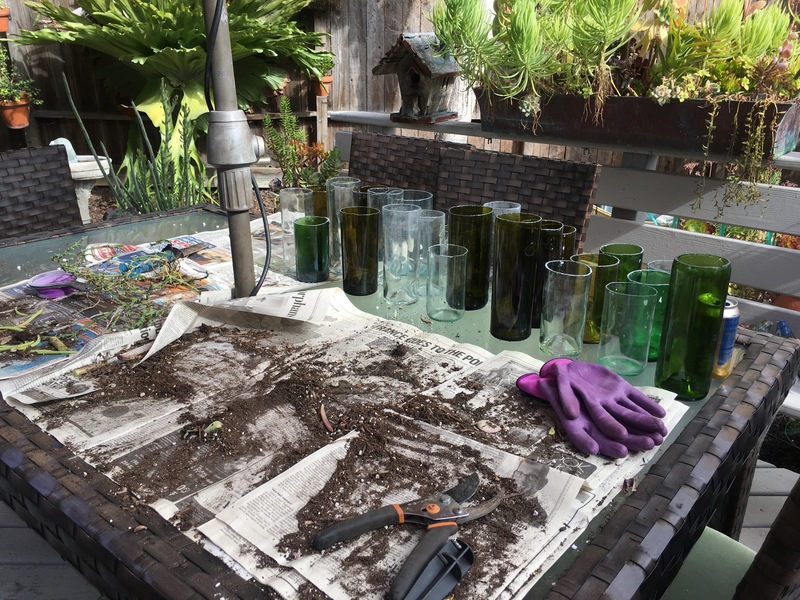 A big part of our planting was gathering about 75 wine bottles (okay – so it wasn’t too hard), but the work was cutting off the tops with a special glass cutter and sanding each bottle so they were not sharp. 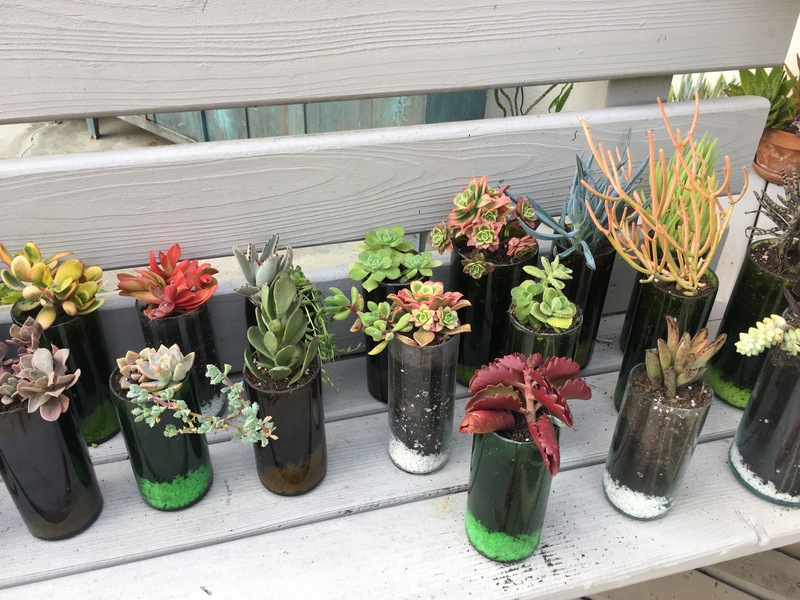 After doing this with only clear and green bottles, we also drilled a hole in the bottom of each bottle and added a half cup of white pebbles for drainage. 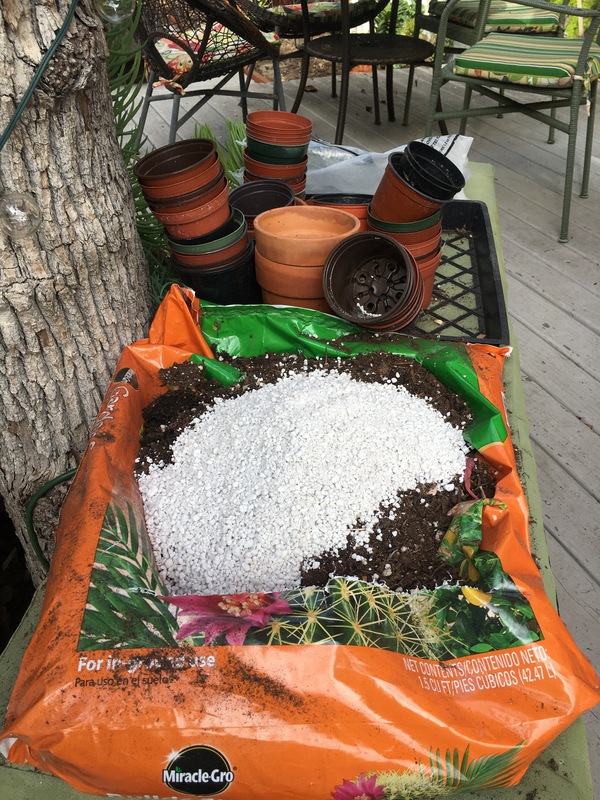 Today, 6 weeks out, we filled with cactus-friendly soil and stuck in the cuttings, then watered well. I’m going to keep a close eye on them the next few weeks to make sure they get love and water as needed. I should also mention that we collected a lot of tin cans (aka soup cans) and painted them with chalk paint in several colors. 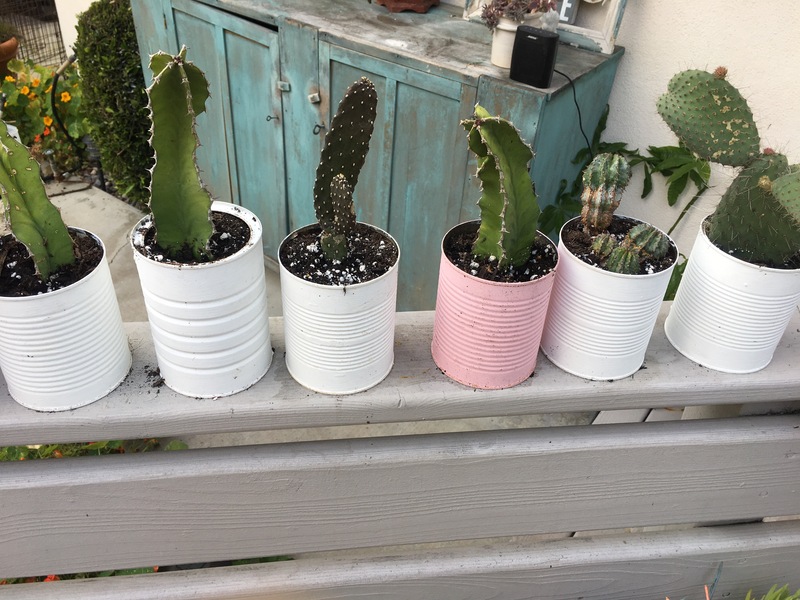 Chelsea wants to use these for cactus, and top with colored sand as you can see in the photos. Those will ring around the wine bottle vases, along with votive candles and a variety of clear small vases that will have fresh flowers, like daisies etc. I hope that you enjoy following this process. We will show you the final table in a couple of weeks. Thanks for following!